Welcome to the Mer Bleue Conservation Area. Located south-east of downtown Ottawa, Mer Bleue is little piece of north hidden in the south. The area features a number of hiking trails including the Bog Trail Boardwalk. Parking for the boardwalk is located at the end of Ridge Road, which is off Anderson Road. The hike is a 1.2 km loop and takes about 45 minutes. The terrain is pretty easy, for most of the hike you're on flat wooden plank with only the last few hundred metres being on old fashioned dirt. Dogs are not allowed. When you arrive at the parking lot head south past the outhouse towards the bog. Along the way there are a number of information panels explaining the history and science of the bog. You'll eventually arrive at a series of four panels at a fork in trail, from here turn right and the boardwalk is right there. Mer Bleue is actually an ancient channel of the Ottawa River. During the last ice age this area was under several kilometres of ice, when the glacier receded this new part of the Ottawa River was created. Over time the flow changed and thus the Mer Bleue Bog was born. As you cross the open water along the boardwalk you'll notice the trees and plants ahead of you are a little different than what you just saw near the parking lot, that's because they are. 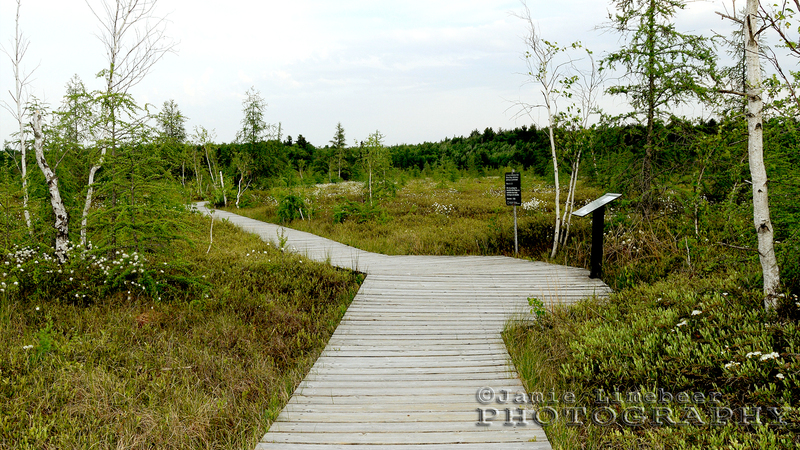 Mer Bleue is a boreal peat bog, some flora can't grow here where others thrive. 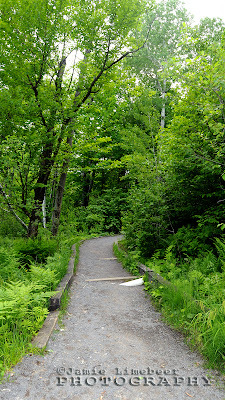 As you continue along the trail you'll notice trees such as black spruce and tamarack as well as ground cover or blueberries and cottongrass... these are normally located in more northern climates. As mentioned earlier, this trail is a loop so you'll eventually be sent back towards the ridge. But before that happens you'll be treated to a nice close-up of an old beaver lodge. Of all my years of coming to the bog I have never seen a beaver using this lodge but don't be surprised of you see any swimming around. The area is very active with wildlife... it not uncommon to see muskrat, turtles and even the odd moose. If you're a photographer, this is a great area for taking shots of animals. As you near the end of the boardwalk it means your hike is almost over. The last few hundred metres are in the woods along the edge of the ridge overlooking the bog. 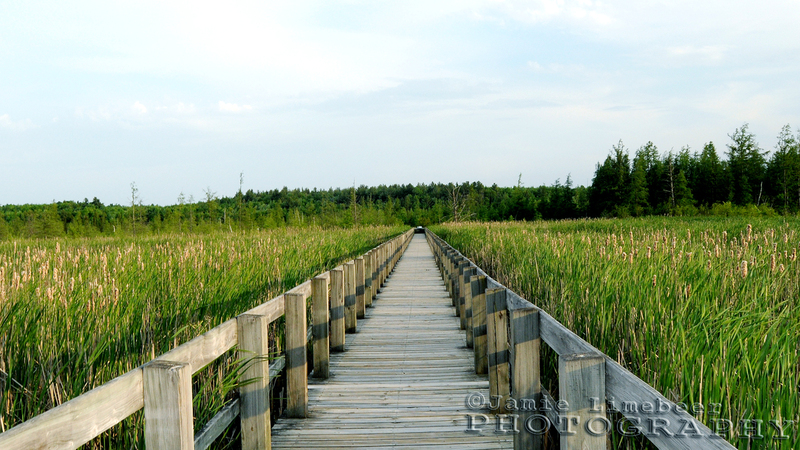 This spot provides a few great views of the marsh as well as few spots to sit down for a picnic. 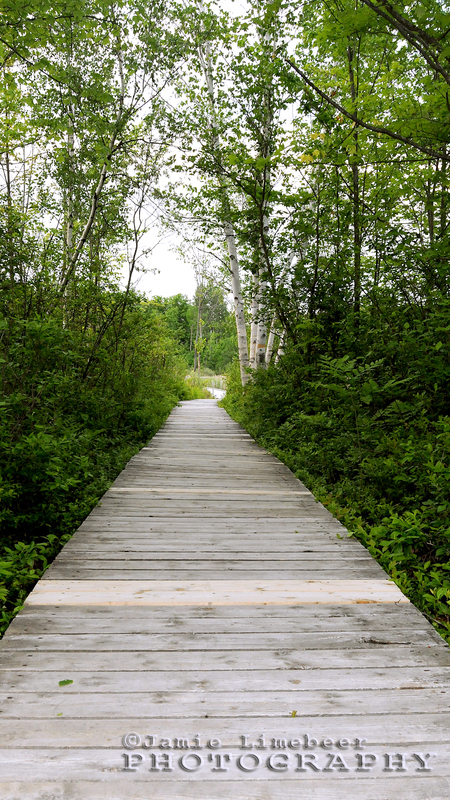 Enjoy your hike at the Mer Bleue Bog Trail.